A Doppler ultrasound test uses reflected sound waves to evaluate blood as it flows through a blood vessel. It helps evaluate blood flow through the major arteries and veins of the feet. It can show blocked or reduced blood flow through narrowing in the major arteries. It also can reveal blood clots in leg veins (deep vein thrombosis, or DVT) that could break loose and block blood flow to the lungs (pulmonary embolism). 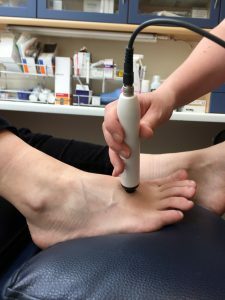 During Doppler ultrasound, a handheld instrument (transducer) is passed lightly over the skin above a blood vessel. The transducer sends and receives sound waves that are amplified through a microphone. The doctor listens to the sounds produced by the transducer to evaluate the blood flow through an area that may be blocked or narrowed. 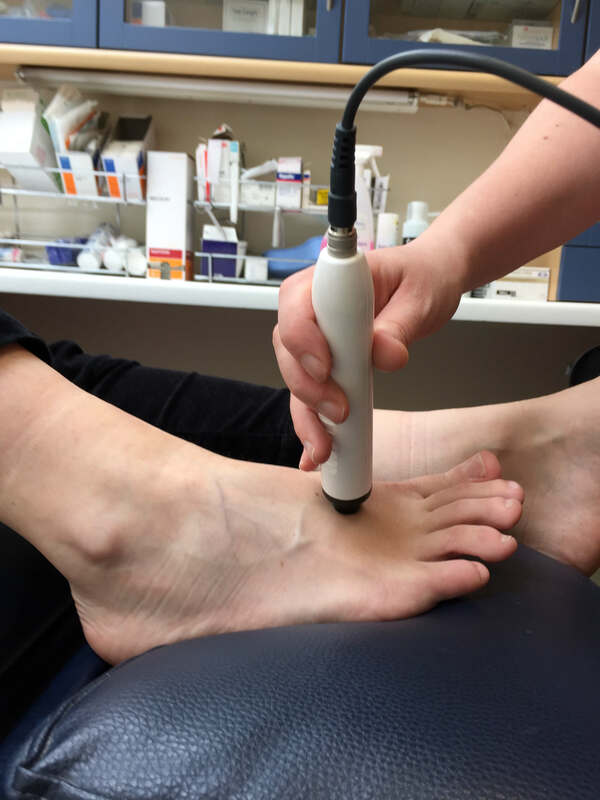 Doppler ultrasound is done to detect blood clots and blocked or narrowed blood vessels that reduce the blood flow to the feet. A reduced blood supply can produce loss of muscle or nerve function. In the feet, a reduced blood supply can result in ulcers or loss of toes, or any part of the foot that doesn’t receive a sufficient blood supply to keep it alive. People with reduced blood supply may injury themselves, and then have an inability to heal after the injury because of a poor blood supply. A person with a reduced blood supply may be advised not to have foot surgery to correct a deformity, as the foot may not have an adequate blood supply to heal after the surgery. Bi-phasic Vessel has become less elastic. This may be part of the normal physiological process of aging or due to stenosis Sound has two parts and is more dampened than the tri-phasic and is heard at a lower frequency Oedema may distort a tri-phasic sound so that it is heard as bi-phasic. If the optimum position for the probe has not been found a pulse may appear to be bi- phasic because the best possible location for the artery has not been determined. Monophasic Diseased Vessel Sound has a simple component and is of lower frequency. Sound descriptors include “whooshy” “roaring wind” or “soldiers marching”. In a very diseased vessel the sound can be similar to a vein which appears as an almost continuous “whoosh”. Arterial sounds can be distinguished from venous as the latter modulate with the respiratory cycle by mirroring the breathing pattern.